Hands-on education cannot be achieved in the classroom. It covers understanding of the administrative tasks, mentorship, supervision, the peculiarities of work within the company. It provides knowledge based on mistakes and practice. Personal and professional networks and supporting these contact is an important contribution to the long-term career. Resume building is an essential skill that lets the employers judge upon the candidate’s professionalism, experience and other peculiar qualities even without meeting. It lets the employers conclude on the possible future perspectives of a person in the company. Getting references is a component that lets an intern get people, who can speak about his/her professionalism and capabilities. It shows how the executives and coordinators can affect the future career of a person. Pursuit or elimination shows that the crucial benefit of any internship is the ability to understand what one likes or not. “Trash can resume” traits comprise the following ones: more than 1 page length, objective statement that was used for another internship or job, “text me” messages, no contact or education information, wrong format, lack of chronology, address or contact information, usage of coloured ink or photo. Social networks are effective ways to communicate and exchange any information very quickly. Lauren Berger discusses states that Facebook, Twitter and LinkedIn are helpful to define personal and professional brand. It lets people brand themselves, show passion and knowledge in this or that field. Furthermore, it is a great way to monitor the dream companies. The preparation to the interview should include the research of the company website, the positions ad internships it offers. It is necessary to send some materials about yourself before the interview. The resume has to be properly formatted, include all the necessary information. The cover letter has to be written “to-the-point” and show why one is the right person for the internship. The letters of recommendation are desirable. Some extra materials like writing samples, business cards, online and hard-copy portfolios can become helpful depending on business. Facebook, Twitter and LinkedIn are useful to get a conversation with the company representative and show yourself from the best sides. Networking 101 introduces the tips how to make the potential employers endeared. In such a way, it is necessary to introduce yourself and make as much people as possible get to know about you. Secondly, deeper relations with staff that should imply confortable speaking, understanding the needs and motivation of one another is an important point. Organization of the contacts in Excel or any other program is the step that will not let you get puzzled about the new acquaintances. The informal meetings are also important and should be organized properly. At first, the participants are determined. Afterwards, the notes about the further actions can be taken. Additionally, mini-agenda is necessary to define the questions that will be discussed. It is important to get prepared with the means to note down the new information. Finally, the closure of the meeting has to provide the contacts of people. 6 tips for making the most of the internship include the following. It is important to volunteer for almost everything, show the initiative and not rely on others. Secondly, it is important to react quickly and give undivided attention to the employer. Thirdly, it is essential not to sit doing nothing, but find work all the time. Fourthly, it is necessary to listen attentively and take notes while getting tasks. Fifthly, each intern has to keep company information private and be trusted. The sixth tip is tracking all the accomplished tasks in order to follow to be perceived as responsible and attentive. The biggest “take-away” from Berger’s All Work No Pay is that the employers need the attentive and hard-working professionals. In order to become such, one should take all possible opportunities to get new connections and show the best sides of self. Properly formatted resume, cover letter and recommendations are the essential advantages for a young specialist. 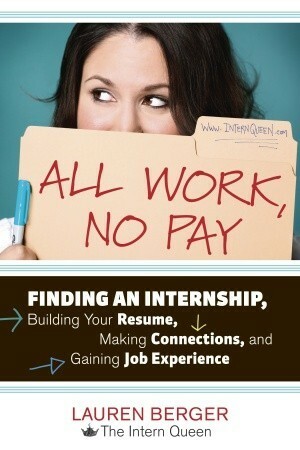 However, it is important to stay wise and get the most experience from any internship or working place. Berger, Lauren. All Work No Pay. Berkeley: Ten Speed Press. 2012. Print.